Economical, multi-rib radials designed or even wear, wet traction and high mileage. 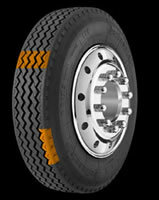 Multi-service tread compound for local and long haul service. Solid shoulder design reduces noise and provides even tread wear.